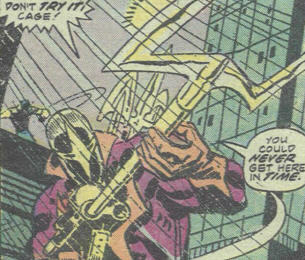 Powers: Spear wields a unique spear-gun, apparently of his own design, and is an expert marksman with it. The gun fires a variety of specialized ammuniton, including forked spears, incendiary and explosive shafts, and hollow shafts containing messages or gas. He is also a skilled hand-to-hand combatant, and is quite agile as well. Spear's costume is armored, particularly around his face, and enables him to withstand superhuman blows. (Power Man I#35, f/b) - Spear's convict brother, Jack Daniels, was dying of an inoperable brain tumor and agreed to submit to Noah Burstein's early "Power Man" experiments. Unfortunately, the process only increased Daniels' agonized death. Daniels' brothers blamed Burstein, and began developing identities that would serve them in that quest. (Power Man#28) - Spear watched Noah Burstein from the shadows. Burstein noticed him, but said nothing to Cage. (Power Man#33) - Spear fired on Burstein while the doctor was walking with Luke Cage and Claire Foster, largely so that he could draw Cage into battle and deal with him first. Despite the Hero for Hire's best efforts, Spear still managed to get off a near-fatal shot at Burstein and escape. Shortly thereafter, Spear fired a message-bearing shaft at Burstein, which confirmed Burstein's. suspicions as to his identity. Burstein was to guilt-ridden to tell anyone else, and as such was alone when Spear again threatened him a day later. 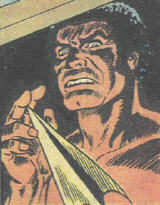 (Power Man#34) - Spear was tracking Luke Cage's movements, and was thus on hand to rescue his brother Mangler after an ill-advised attack on Cage. That night, while Mangler distracted Cage, Spear again threatened Burstein and again allowed the doctor to live. This time, Spear left Burstein a message telling him to meet the assassin at an East River pier. Burstein went to the meeting, and Spear, well, speared him before Luke Cage's eyes. Two young adults saw Spear escaping by the pier. Spear next attempted to rescue Mangler from police custody, but failed duie to Cage's interference. After Spear's mother, not wanting to lose another son, tipped Cage and Quentin Chase as to his whereabouts, the pair confronted Spear at his tenement apartment. Spear engaged Power Man in a running battle that took them onto the roof of an outbound bus, and finally (when the bus crashed) into the Hudson River. Cage finally managed to deck the villain in the waters, and dragged him into police custody. (Power Man and Iron Fist I#100) - Shades and Commanche again fought Cage, as he was part of a raid on Meachum's facility, to gain back the soul of Iron Fist, which had been stolen by Master Khan, who as Meachum's silent partner. Cage cracked a large pillar and dropped it on them, taking them out of the fight. (Shadowland: Power Man#2) - Deadly Nightshade, leader of the Rivals gang, organized a group called the Flashmob, comprised of former opponents of Luke Cage, specifically Spear, Commanche, Chemistro, Cheshire Cat, Cockroach Hamilton and Mr. Fish, to tackle the new Power Man (Victor Alvarez), and they soon challenged him on a rooftop. 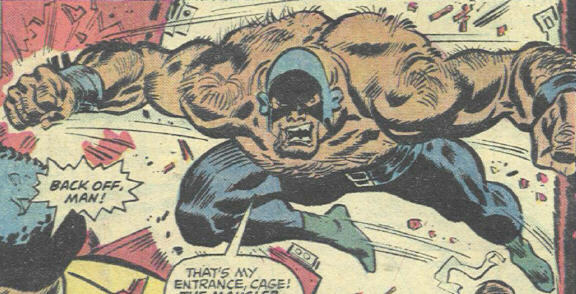 Spear quickly pinned Power Man to the wall, but was knocked out by Luke Cage. (Shadowland: Power Man#2 (fb) - BTS) - Spear was taken into custody on Riker's Island. Later, Deadly Nightshade's solicitor, Mr. Donovan, reported to her that Spear had been freed. (Spider-Island: Heroes for Hire#1) - Spear and the Flashmob, as well as Cottonmouth, tried to leave spider-infested Manhattan via a bridge, but were stopped in a furious battle with Misty Knight and her Heroes for Hire (Black Cat, Falcon, Gargoyle, Paladin, Silver Sable). I've seen, at a few McGregor forums, statements from the writer that Marv Wolfman altered his Spear story from his original intentions. I'm not sure as to the nature of those changes, but there's a definite shift in tone and pace in Power Man#35, McGregor's last issue cowritten with Wolfman. Recipients of Burstein's process to date include Spear's brother Jack Daniels, Warhawk, Luke Cage, (Cruz) Bushmaster, (John) Bushmaster, and Power Man Steele. Spear's other brother, Mr. Daniels was a professional wrestler who also blamed Burstein for Jack's fate. He was a moderately-skilled combatant, but was no match for Luke Cage. He initially attacked Cage on his own, hoping to aid his brother's schemes, but had to be rescued by Spear. Later, Spear sent Mangler to distract Cage, but Luke beat him unconscious in the resulting fight. Mangler nearly escaped the police with Spear's help, but was brought down by Cage and returned to jail. Spear's convict brother, Jack Daniels, was dying of an inoperable brain tumor and agreed to submit to Noah Burstein's early "Power Man" experiments. Unfortunately, the process only increased Daniels' agonized death. The mother of Jack, Spear, and the Mangler.